One of the challenges often faced by cocktail enthusiasts is reconciling the fact that vodka—the most popular spirit in North America—isn't fairly represented in classic cocktail books. In fact, you just don't find mention of vodka in many of the old texts. It's as if no one had even heard of it until the Cold War when James Bond's martini and the Moscow Mule came along. Even here at Summit Sips we are guilty of tipping the scales out of balance. It's not intentional—we just don't cover as many vodka recipes as we probably should, given the likelihood that our readers probably want us to. As any regular reader will attest, I am a fan of classic cocktails. It would be hard to write these posts if that were not the case, since even contemporary combinations usually find their roots if not their inspiration from the classics. I especially love it when fantastic flavors result from simple recipes. When such a recipe also happens to be versatile enough to yield multiple delicious variations—the cocktail is, well, the Bee's Knees. STEP.HEN, keepin' it real, Yo. Imagine my delight to find out that my brother-in-law enjoys the exact same vodka martini that I do: Ketel One with a twist. It's so simple that when I thought about posting something about it today for his birthday, I decided to take a more inspired approach—one with a few more "steps". Eleven months ago my wife and I visited the man of honor in San Francisco where there's no shortage of great cocktails. During our visit, the better part of one evening was spent hanging out in the loft we rented, dancing and drinking Whiskey Sours. We also laughed about what our names might be if we were rap musicians. With The Fourth of July weekend coming, I suppose I could have found some cockail to evoke US patriotism, or perhaps one that includes the colors of the flag. Instead, I decided to feature a mixology technique. The Riff is actually a name I am using here to represent many cocktails—both classic and contemporary—that began life as a varition of an existing recipe. To riff on a cocktail is to make some addition, substitution or adjustment, taking the drink in a new (and hopefully delicious) direction. The way I see it, the cocktail itself is an American invention, so what better way to honor that heritage than to focus on the true spirit of innovation. Buying Spirits on a Budget. Rum? These days, not many people can justify spending $100 on a bottle of wine, and for most of us, even $20 is enough to feel pretty uncomfortable. The same goes for cocktails. While retail establishments might offer drink specials to keep customer's "happy" to spend an "hour" or more after work, it's no surprise that the rest of us are spending more time drinking at home. 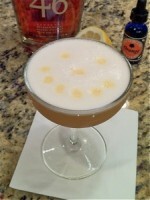 So, how can the mixologist save even more when trying to build up a home stock? The short answer: Rum.